This year has been a whirlwind, hasn’t it? It seems like the holidays were just yesterday, but yet Mother’s Day is a mere two weeks away, on Sunday, May 8th this year. We recently brainstormed some fun homemade gift and Mother’s Day Gift Baskets pairings ideas on our website, and wanted to shed some more light on one of our favorite homemade gift ideas – cookies! Yumtastic cookies are certainly the way to Mom’s heart on Mother’s Day , and combine them with our Mother’s Day gift baskets to really hit it out of the park! First, cover two cookie sheets with wax paper, and set aside. Combine flour, baking soda, and salt, and set aside. Use your mixer on a low speed to whip butter until creamy. Then, begin gradually adding the two sugars, and continue beating until it has a fluffy consistency. Add each egg one at a time. Stir in the flour mixture and the vanilla. Drop dough balls onto the baking sheet, leaving about 3 inches between each cookie. Flatten the dough slightly to ensure it is in the shape of a cookie. Bake on the center rack of your preheated oven for about 20-25 minutes. Cool in the pan, and transfer to wire racks to cool completely. Taking the time and putting in the thought to bake Mom cookies for Mother’s Day and selecting a pretty Mother’s Day Gift Basket for her goes a very long way in showing her how much you care. The days go by fast, and in a heartbeat you transform from her little girl or boy to her very grown up daughter or son, and you’ll be reassuring her that you’ll always need her and want to treat her on her special day! This Sunday is Easter Sunday, and we hope you have a wonderful Easter, all! 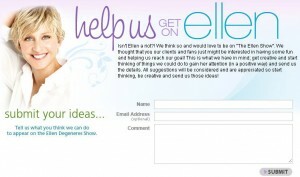 While we’re busy bees crafting Easter Gift Baskets, we’re all daydreaming of the same things here at BisketBaskets.com: being on Ellen! We can’t get enough of The Ellen Show – Ellen DeGeneres is one fearless, fantastic female, and she’s truly our role model. We’ve kept Bisket Baskets alive and well for eleven plus years now, and it’s only through dedication and the continual drive to move forward that we’ve accomplished this, traits that Ellen shows in all of her actions, and one of many reasons we admire her so greatly. It’s been our mission for the last few years to get our gourmet gift baskets, like our so fun Dog Gift Baskets, on The Ellen Show. Just like Ellen’s quirky personality, our dog gift baskets are a unique idea first created by us and continually improved with healthy dog treats and fun dog toys! We want to be able to thrive for many more years, and being on The Ellen Show would help show an even wider audience how beautiful our gift baskets are! We need your help to achieve our dream of being on The Ellen Show! Tell us in the comments below or visit our Help Us Get On Ellen page to share your ideas on how we can get on Ellen – and hey, if you personally know her, help your favorite gift baskets business out!